The Wittmann Group is introducing new W853 pro and W863 pro robots for large injection molding machines. These robots are best used with machines in the clamping force range of 1,300 to 2,400 metric tons – ideal for handling automotive components, white and brown goods, as well as technical parts. Based on the same mechanical concept, the Z axis and the X axis of these two robots are driven by a gear rack. Carriage guidance is assured by an all-purpose high-precision recirculating linear ball bearing system. The vertical drive is transmitted via a combination of gear rack and belt, whereby strokes ranging from 2,000-3,000 mm are available. The two new models are different in regard to the length of their axes and their payloads. 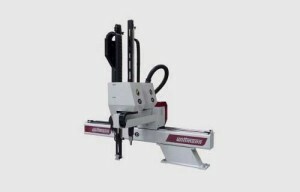 The W853 pro is designed for a payload capacity of 40kg – whereas the W863 pro is rated for 75kg, which makes it particularly well suited for use in the large machine segment. Both offer all the familiar features of the W8 pro series, said Wittmann. Standard equipment includes the ambiLED status display and the new decentralized drive control. In addition, the new large models can use the intelligent EcoVacuum function, which is a shutdown function of the vacuum producer. It reduces the robot’s demand for compressed air and thus saving operation costs. The new robots are also equipped with the R8.3 robot control system as standard, which provides access to many special real-time functions, e.g. the iVac intelligent vacuum system with teachable switch-points, the QuickNew function for easy programming via a visual selection system, or the SoftTorque program for a flexible removal motion based on the ejector motion of the injection molding machine . Apart from the big robots, Wittmann has also developed the new WL80 robot for a payload capacity of up to 2 kg. Integrating the energy chain into the horizontal arm minimizes the space requirement, which is especially advantageous when this unit is operated in protective housings and used in integrated applications, the company explained. The WL80 is available with a horizontal stroke of 1,200 mm, and is therefore suitable for injection molding machines with clamping forces ranging from 30 to 60 tons. The vertical stroke is 700mm, and the unit can also be equipped with a second vertical axis. In that instance, one of the two axes is equipped with pneumatic pivot, and the other axis is equipped with a pneumatic sprue gripper. Even then (i.e. when two X axes are required – what means there are five servo axes instead of three), the dimensions of the electrical cabinet remain the same, according to Wittmann. “We think that there will be two main application areas of the WL80. On the first hand, it will be used in the Asiatic region with the compact injection molding machines that are predominant there. On the other hand, we will install this device as a part of our own integrated mold-cell production solution, with minimized footprint,” Stammhammer said.